At our house, we have two boys who love to play sports outside and spend a lot of time on their knees stopping goals, a daughter who loves to get play in the dirt/sand/mud, and a husband who plays soccer 2 to 3 nights a week, so needless to say there never is a shortage of laundry to do. At first I always used Tide since that’s what my mother always used, then the kids came along so Ivory Snow was thrown into the mix. Then, after becoming more educated on what ingredients companies use and how that can affect us and our environment, I decided to be much more concious of what I was using around the house, in terms of cleaning supplies, food, bath and body supplies, etc.It became very important to me. At first I started using Ecos, a soy based laundry detergent, but I wasn’t very happy with the cleanliness of the clothes. I researched laundry detergent online and came across a numerous amount of blogs and websites that make their own detergent. I thought about it and decided that it couldn’t be that hard and felt that this was the best choice for my family. I could control what I was putting into it. 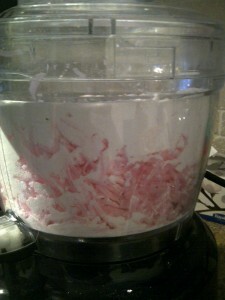 I knew that I wanted powdered detergent, not liquid, and so I tried a few different recipes. Over time I found that I like the one found here. 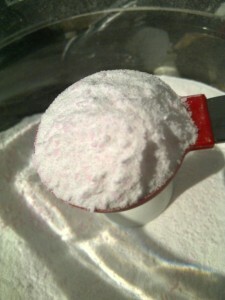 Homemade laundry detergent is very easy to make, it’s economical and I find that as long as I’m on top of the stains, it cleans quite well. If you would like to try it out, here’s what you need. Grate the bar soap. I buy Zote soap which is available in Hispanic/Latin stores, but you could use Sunlight, Ivory or another kind. When I grate the whole Zote bar soap I get about 8 cups of grated soap, therefore I just make 8 times the recipe. 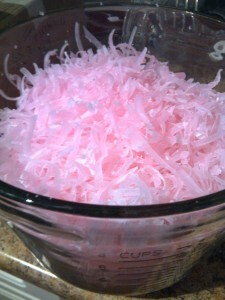 Put 4 cups of the grated soap in a food processor. Add 4 cups of washing soda and 4 cups of Borax. Process until it’s mixed well.